Minerva Promise introduced her three daughters to the world as “The Promise Girls,” three test-tube babies who from the womb had been reared to become prodigies in the arts—Joanie in music, Meg in art, and Avery in literature. By 1996, Minerva’s book about her daughters has earned them a certain celebrity, which she hopes to increase through a tour and media exposure. Seventeen-year-old Joanie, the eldest, hates being in the public eye, and when Minerva and the Promise Girls are making an appearance on a popular, national talk show, Joanie intentionally makes an error in her piano solo. The mistake earns her a brutal slap from her mother—in front of the studio audience and the television cameras. The girls are removed from their mother’s care and placed in foster homes. Twenty-one years later, having settled in Seattle, Washington, where she moved at nineteen, Joanie is a single mother with a seventeen-year-old son. She supports her small family by making reproduction costumes for historical reenactors and others. Meg and Avery joined Joanie in Seattle as soon as they were legally free to make that choice. Meg is married to Asher Hayes, a builder of small homes, and they have a sixteen-year-old daughter. Meg has given up painting to be “bookkeeper, scheduler, office manager, and co-designer” in her husband’s business. Avery lives in a tiny cottage behind Joanie’s home and supports herself through a series of low-paying jobs and part-time work as a storytelling mermaid. The sisters are close, but they have little contact with their mother. They are initially horrified by the plans of successful documentarian Hal Seeger to make the Promise Girls the subjects of his next project, but when Meg has an automobile accident that leaves her with amnesia and astronomical medical bills, they agree to cooperate for the money. Joanie is angry and depressed by all the memories stirred up by the documentary and by Minerva’s reentry into their lives. Meg is dealing with rediscovering who she is and how she will relate to a husband and child she cannot remember. Avery is trying to survive job losses and a broken heart. As Hal Seeger continues to probe their pasts, old secrets are revealed, new relationships are begun, and old ones are renegotiated. With this book, Marie Bostwick once again proves herself an accomplished teller of women’s stories. Joanie, Meg, and Avery are engaging characters rendered credibly complex by the scars from their past and by their flaws. They are interesting as individuals and as a trio of sisters whose tight bond does not exclude edgier facets of sororal relationships. Even Minerva proves to be more than the narcissistic, exploitive creature that she at first seems to be. The teens, Walt and Trina, are appealing and believable, and they are integral to the story rather than token kids. 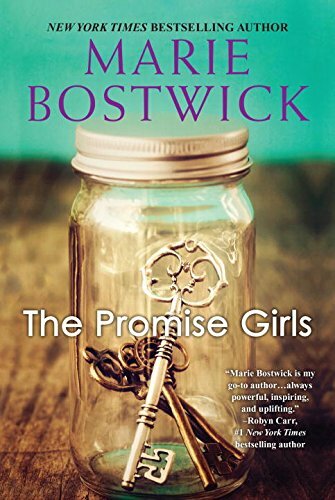 The Promise Girls is women’s fiction, but a romantic thread is part of the story of each of the three sisters. Asher, Hal, and Adam are all likable characters and ordinary guys who are revealed to be extraordinary, each in his own way. The three couples provide an assortment of tropes: a reunion romance of sorts (Joanie and Hal), a marriage-in-trouble romance (Meg and Asher), and an abbreviated friends-to-lovers romance (Avery and Adam). Their stories are substantial enough to satisfy romance readers. I’m marking this book a keeper. I definitely recommend it for readers who like novels in which women’s experience is central and broad enough to include their roles as daughters, sisters, lovers, wives, and mothers. Wow, that sounds like quite the plot. And it also sounds like it's right up my alley. Thanks for the review! Interesting book. I will have to give it a try. I love Marie's books hope to get this one.